HEY SPRING, I’M READY FOR YOU! This post is sponsored by Wakakuu. Together with the Scandinavian online retailer Wakakuu have I chosen some super amazing pieces for the winter to spring transition! Wakakuu features brands such as Totême, Filippa K, Marni, Little Liffner, Ganni, Rodebjer, Wakakuu Icons, By Malene Birger, Acne Studios and many more. The pieces I have chosen are super classic, minimal and versatile which makes them easy to dress and if you know me you know that I always talk about classic and versatile pieces because it's a way to be creative with your items in your wardrobe. The mixed wool Totême (link) suit blazer is one of my absolute favorite pieces. I am a big collector of the more masculine oversized blazer and those are items that will follow me through out any season of the year. I would style it with a dress, denim cycling shorts with a white t-shirt, with a tighter fit suit pant (link) in blue or in a darker grey, like the ones from Five Units. (link). The list goes on! And hey that's what I love. Wakakuu also released their own collection Wakakuu Icons consisting six basic pieces and one of them being the black wool coat (link) with a fantastic sleek and flattering fit that I'm wearing in the photos! Finding high quality leather handbags can be tricky without spending a big amount of money which is why I am so amazed by the Stockholm based accessories brand Little Liffner founded by Paulina Liffner Von Sydow in 2012. 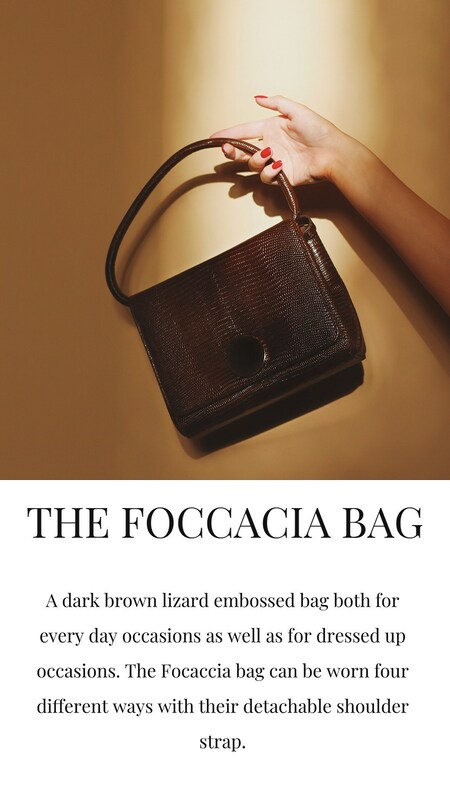 The dark brown lizard embossed bag in calf leather (link) stood out to me by its minimal but strong and luxe hardware and the everyday practical size. It's going to be a friend of yours for years! In these photos I styled the bag for a dressier occasion with the little black Ganni dress (link). And best of all is that you will get 15% off your purchase at Wakakuu with the code WAKAFELICIA15 to invest yourself some fresh spring and summer items. Happy shopping!